A true family-run business from Dessel with a strong commitment to innovation, curiosity and sustainability. They completed projects in Belgium, the Netherlands, Germany, the UK and France. 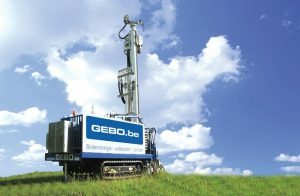 Gebo is a major player in the market for soil drilling for water extraction and geothermal energy applications. Today, approximately 70 years after the foundation of Gebo in 1949, 30 qualified employees strive for a sustainable and qualitative solution to your drilling problem. “Energy from the soil is the gold of the future…”.